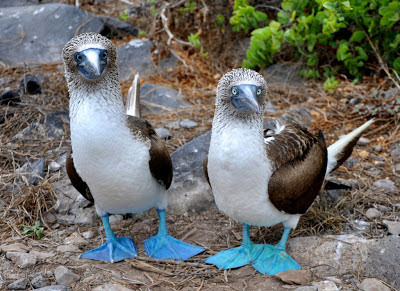 Ask any visitor to the Galapagos Islands what they loved about their trip and they are bound to tell you all about our fabulous Blue Footed Boobies. I mention them in many of my posts because we see them on every Island. Typically when I write about those funny, clown-like and fascinating inhabitants of the Galapagos Islands, I talk about their mating habits and their adorable and irresistible little chicks. Any one lucky enough to experience their mating dance will have a memory to last a lifetime. I show this ritual in my Espanola Post. I'm often asked why these birds have blue feet. It's a particularly intriguing question because almost every Galapagos animal or bird species blends into the stark volcanic environment with its pallet a range of brown, beige, sepia, and black, interspersed with green scruffy plant life. How then did they end up with bright blue feet - and electrifying color in contrast to the earthy tones? The answer goes right back to the mating ritual. The males strut around displaying their feet to the females who, in turn, are attracted to that azure color. The bluer the better and more magnetic. The Boobies' feet serve the same purpose as the coloration of so many male birds, like cardinals or frigatebirds. Don’t let its small size mislead you. Though just over 1.9 miles in total area with a maximum altitude of only 1200 feet, Rabida Island is filled with wonders that will captivate you. A veritable rainbow of color, texture, and light, this island hosts abundant flora and fauna, much of it endemic to the island. I don't get to Rabida as often as I get to many of the other Islands, but when I do it is a feast for my eyes, an opportunity for photographers to "go crazy" and a rare and much-loved treat for me. 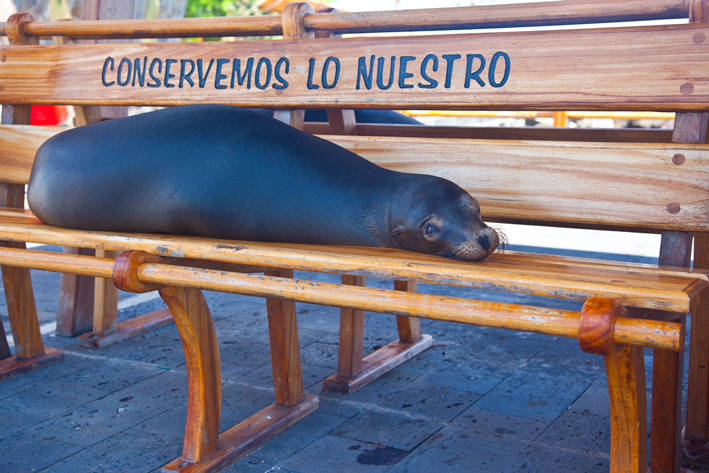 Rabida is located in the center of the Galapagos Islands. It’s a marvelous area for snorkeling as the water teems with fish, marine iguanas and our beloved sea lions. It also offers a special and unique landscape, including the opportunity to walk on a rocky red sand beach. 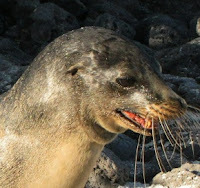 Galapagos Sea Lions - They Are Definitely Not Seals! But, there's a lot to learn about them too. For example, Galapagos sea lions are ubiquitous in the Galapagos Islands. 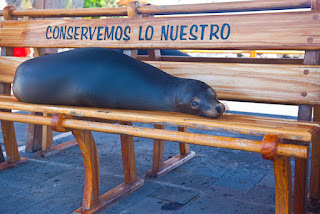 They are endemic and exclusive to the archipelago (except for one location on Ecuador's mainland coastline) and can be seen and heard on every island; the total population is about 50,000 sea lions. They are quite large as sea lions go and range in size from mature males of about 1000 pounds to mature females of about 700 pounds. Pups weigh about 13 pounds at birth.